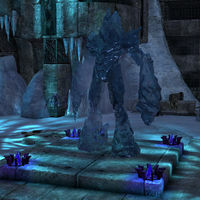 Nomeg Zozumiralpachar is a frost atronach found inside the Balamath delve in Craglorn. He is accompanied by Blackcaster mages and imps. This page was last modified on 12 June 2018, at 04:33.